Looking for a unique fall getaway? Come stay at Captain Montague's Bed and Breakfast and enjoy a one of a kind dining experience at the renowned Culinary Vegetable Institute. This perfect autumn evening begins outdoors at the Culinary Vegetable Institute around a roaring bonfire, with warm cider, mulled wine, cocktails and hors d'oeuvre grilled over the open flames. Enjoy a hay-ride on a Belgian horse-drawn wagon through the CVI grounds while viewing the spectacular fall foliage. Then move indoors and gather around the table for a menu inspired by fall flavors from the garden: Cauliflower, Squash varieties, Potatoes, Cabbages, Kale, and Apples. Sharing the plate with autumn vegetables will be Oysters, Nantucket Bay Scallops, and Duck Breast. The following morning you will be treated to one of Captain Montague's signature breakfasts. Space is limited so contact us today to reserve your room and space at the Harvest Dinner table. 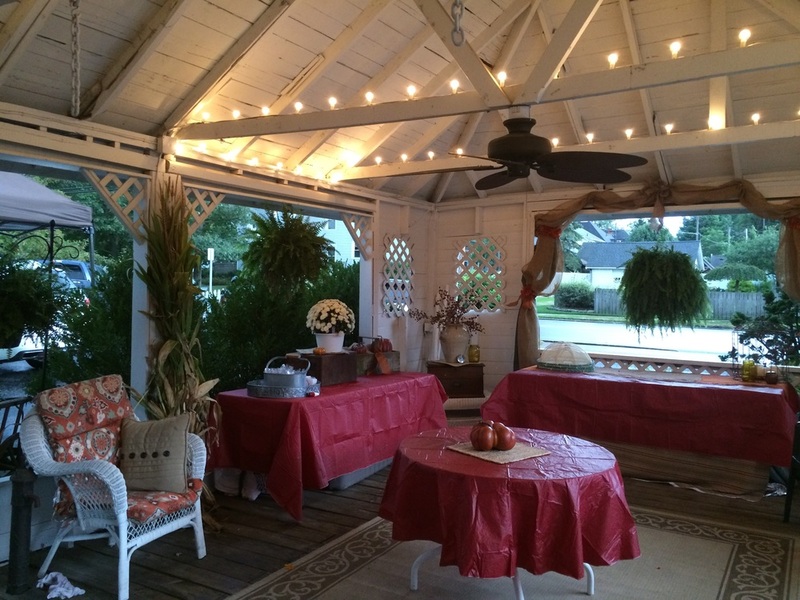 The gazebo and the rest of Captain Montague's is ready for the changing seasons. 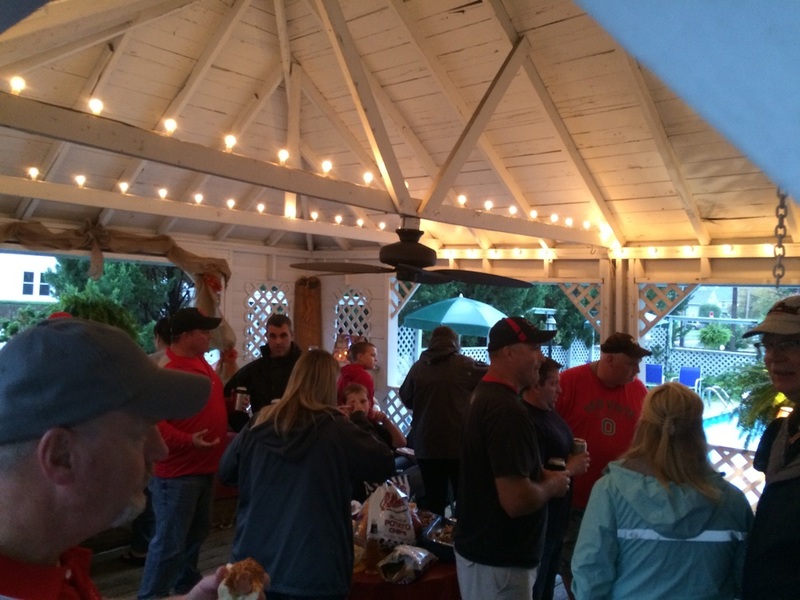 Not even the rain could dampen our spirits as we hosted a pre-game high school football tailgate. Our "newest" room was ready for its first guests last weekend. Sarah's room just received the royal treatment with bold new wall-coverings, soft new carpet underfoot, and a beautiful ornate queen size bed. Waking up in Sarah's Room with one of Captain Montague's signature breakfasts waiting in the dining room is sure to be a wonderful start to any day. Oh Baby - It's A Babymoon! What is a babymoon you ask? A quiet escape for parents prior to the arrival of their child. We recently celebrated our 1st babymoon with these expectant parents. They enjoyed their stay in the Anniversary Suite, complete with chocolates and flowers, a night out at Chez Francois in Vermilion, and then after breakfast took a leisurely stoll along the Huron pier. Looking for a unique shower gift? Or maybe a short get-away for yourself and your significant other? Let us customize your babymoon package and spend a few quiet moments together at Captain Montague's Bed and Breakfast before your special delivery. 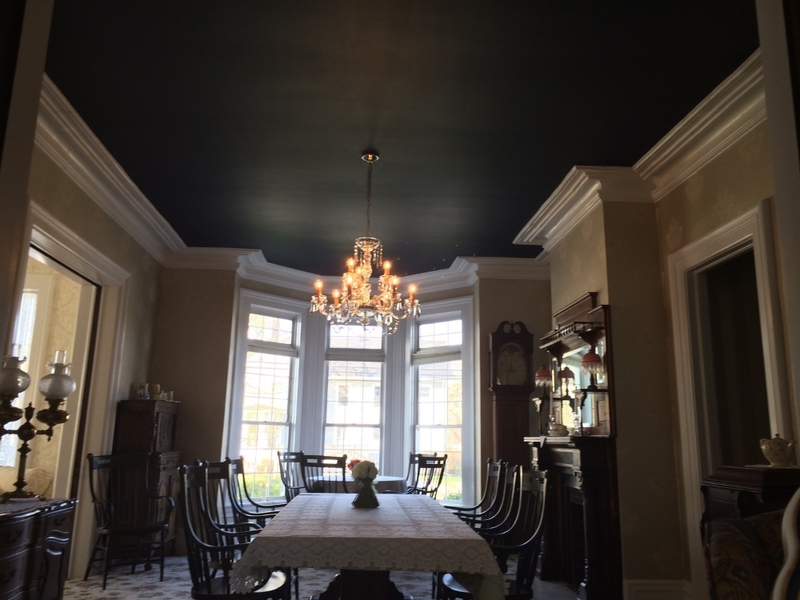 The heart of Captain Montague's Bed & Breakfast, the formal dining room, is making a new, bold, statement. Recently renovated with period wallpaper and a striking navy ceiling, our guests will be dining in style under the Waterford chandelier. With space for 10 around the antique dining table, breakfasts shared with us, at the Captains, are anything but ordinary! Also debuting this month is the new look for our front parlor, or music room. Finished in shades of creamy whites, with an abundance of natural light, this room is a wonderful place to start, or finish, any day. 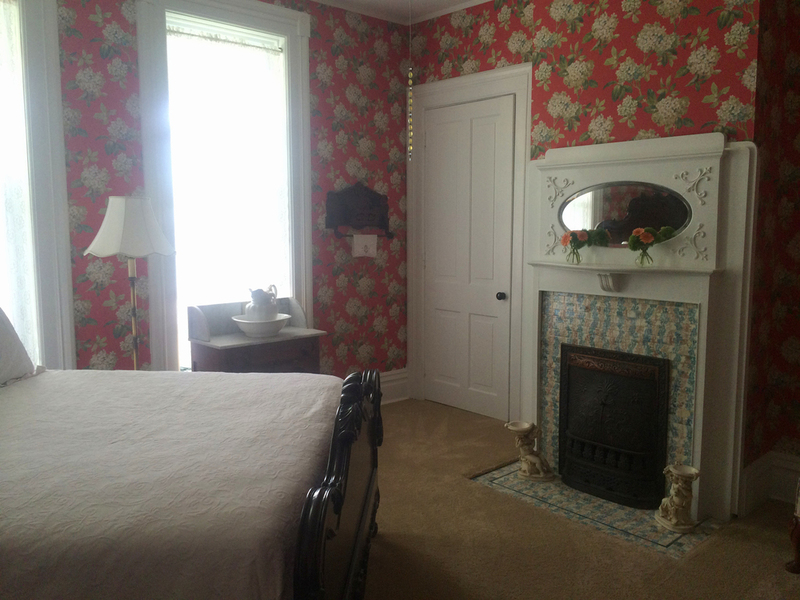 Located on the first floor, in the heart of the bed and breakfast, the Molly Room's renovation is completed and the room has been newly christened The Madison Room in honor of Innkeepers, Bruce and Nancy Brotherton's oldest granddaughter. The renovation was completed in March of 2015 and is ready for guests to enjoy. 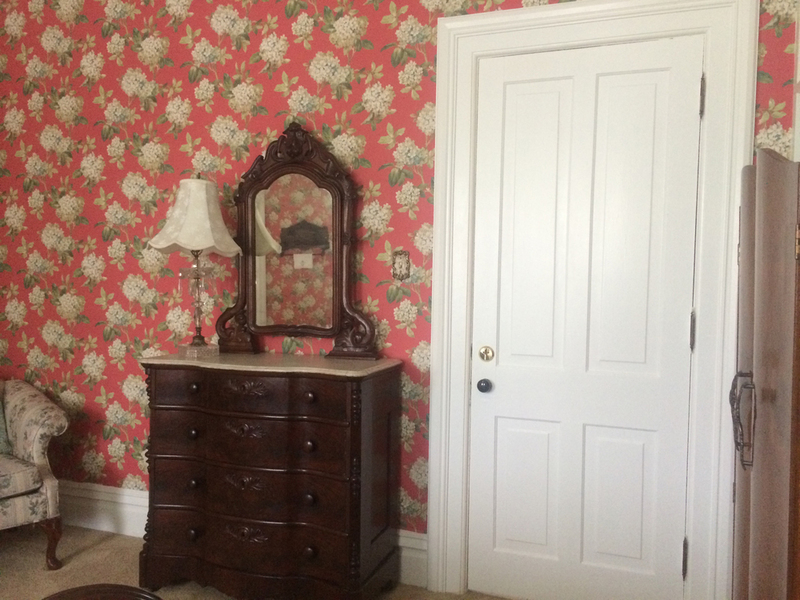 The Madison Room was redone in period toile wallpaper and calming tones of soft blues and yellows. Madison's Room boasts a four poster queen sized bed, cozy sitting area, hard wood flooring and an original oak fireplace. See what we found when we were tearing up the old flooring. We made the front page of the Sandusky Register! View the original article here. 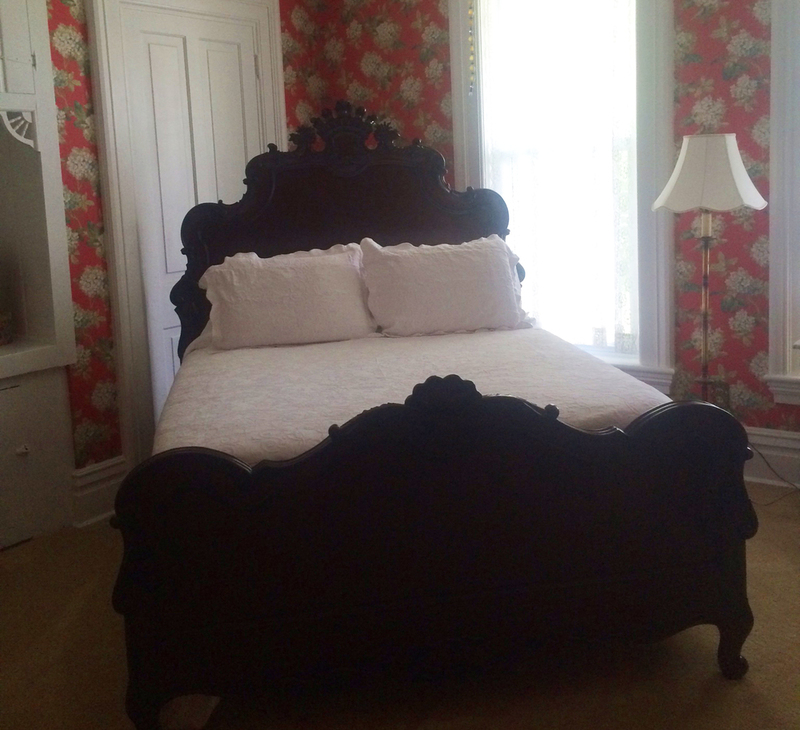 The historic Captain Montague's Bed & Breakfast in Huron is under new ownership. Nancy and Bruce Brotherton took over the inn on Nov. 17. The couple moved to the area from Wellington. Bruce suggested they look for a B&B on the market. They looked on the islands, but nothing felt right. 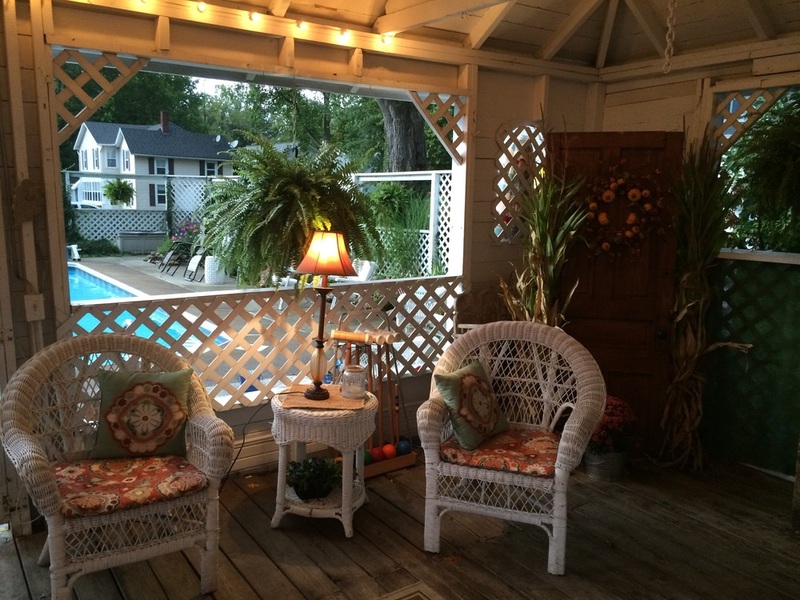 Their youngest daughter then noticed a listing for 229 Center St. in Huron. The home was built in the late 1870s by the owner of the local lumber yard, who is also master ship builder, named John Wickham, said former owner Judy Tann. The home spans an entire block in Huron's lakefront community known as the Old Plat. Wickham built several homes on Center Street. Captain Charles Montague bought the home from Wickham. The captain died of pneumonia while at sea, Tann said. Judy and her husband, Mike, who was the former city manager for Huron, bought the home in 1993 from Bob and Shirley Reynolds. Captain Montague's home had been converted into five apartments in 1958. It was also used as professional offices up until 1982, when the Reynolds rescued it and converted it into a bed and breakfast. The Reynolds family and the Tanns both did work to restore the home. Judy expects the Brotherton's will do the same. “Which is wonderful," Tann said. "That property deserves it." The front doors make a statement with the original beautiful, warm ruby glass. Guests entering those doors walk into the foyer and immediately see its hand-crafted, solid black walnut staircase. 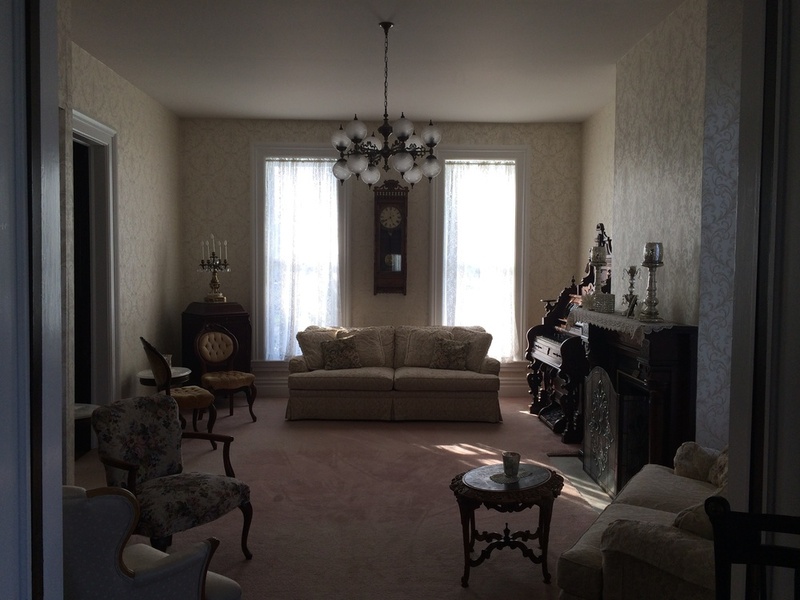 There is red oak and mahogany wood in the home, as well as original plaster crown molding. They advertise five of the seven bedrooms to be reserved for stays. 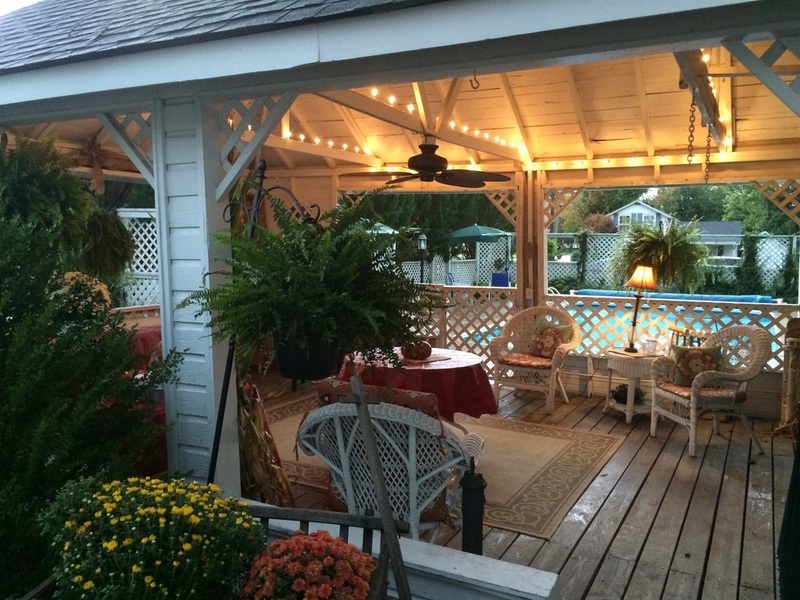 The Victorian home is romantic and honeymooners are some of the first to book a stay. Nancy, who used to operate a restaurant and a Victorian tea room, cooks up tasty food for her guests. “I want to pamper people,” Nancy said. Small parties can be booked as well. The music room contains an 1880 carved walnut pump organ. This is in honor of Sarah Montague, who graduated from the Oberlin School of Music in the 1880s and had a similar organ. The home also contains the Captain's Parlor, known as the billiards room, where men used to retreat to for a drink and a cigar. The history is part of the home's charm. In honor of Captain Montague and his Irish heritage, Nancy and Bruce Brotherton are hosting “Luck of the Irish,” a contest to win a one-night stay at Captain Montague's Bed & Breakfast. The drawing will take place on St. Patrick's Day. Check out their Facebook for details on the contest. A little Valentine's Day fun at Captain Montague's with a "Guess How Many" contest. The winners got a free night stay for Valentine's Day. Be sure to Like Us on Facebook and never miss one of our contests and your chance to win a prize package of your own! Deb and Scott (right), the winners of our Valentine's Day contest, thank you for braving the cold and snow and spending Valentine's morning with us! We enjoyed your company! As is the case in historic homes, you never know what you will find when you begin renovations... My husband and I were having a discussion about WWI this morning, over breakfast coffee. A little later in the morning when the gentleman was installing a new floor in Molly's room, he gave this find to my husband. The floor was layered with old newspapers. How ironic, it's dated Feb. 1917, and discussing Poland and WWI! Stay tuned for more Renovation Updates and treasure finds! The Ohio Hotel & Lodging Association (OH&LA) hosted this year's Ohio Stars of the Industry Awards Dinner Gala in conjunction with its Annual Conference & Tradeshow event at the Hilton Columbus at Easton Hotel in Columbus, Ohio. Six Stars awards were presented to star employees and staff, all of whom have proven a dedication an passion for enriching Ohio's lodging and tourism industry. 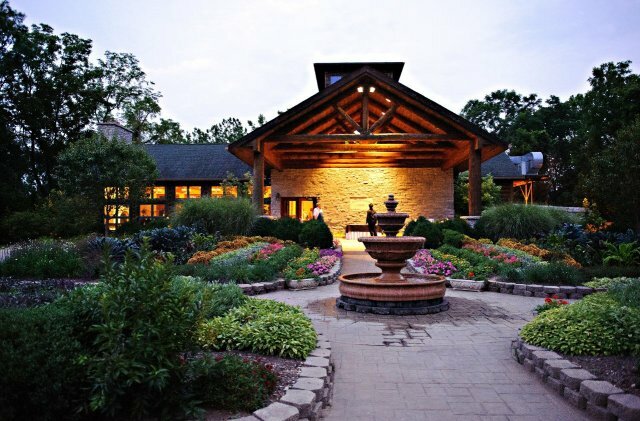 In addition to the Ohio Stars of the Industry Awards, OH&LA also presented its first annual Unique Property of the Year award, to Captain Montague's, honoring us for providing outstanding service and exceptional amenities.